Pancreatic cancer is the most deadly of any common cancer, because the disease is often diagnosed in advanced stages and only 15% of patients qualify for surgery. Scientists from MD Anderson Cancer Center found a novel blood test, which could diagnose pancreatic cancer early. Cells often secrete some small particles containing proteins and nucleic acids into the blood. These particles are called exosomes. The researchers found that exosomes from cancer cells harbored high levels of glypican-1 (GPC1), a cell surface proteoglycan. The researchers analyzed blood samples from 190 pancreatic cancer patients, 32 breast cancer patients and 100 healthy donors. All pancreatic cancer patients revealed high levels of GPC1 positive circulating exosomes (GPC1+crExos). BPD: benign pancreatic disease; PCPL, pancreatic cancer precursor lesions; PDAC, pancreatic ductal adenocarcinoma. GPC1+crExos are superior to the commonly used CA19-9 biomarker. 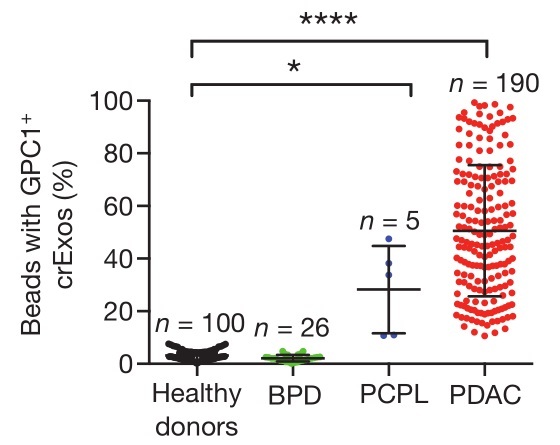 Patients with benign pancreatic disease (BPD) exhibited similar GPC1+crExos levels to healthy donor. However, CA19-9 levels were significantly increased in patients with BPD. Furthermore, the GPC1+crExos test could detect pancreatic cancer at early stage before the disease could be diagnosed by magnetic resonance imaging (MRI). If pancreatic cancer is diagnosed at an earlier stage, curative surgery could reduce the death rates significantly. Routine screening for pancreatic cancer using MRI or CT would be prohibitively expensive and associated with a high false-positive rate. The GPC1+crExos test would be feasible and enhance the accuracy of MRI or CT scans. Axovant Sciences (NASDAQ: AXON) just raised $315 million by offering 21 million shares at $15. The stock closed at $29.90, which valued the company at $2.8 billion. In my opinion, the company doesn’t seem worth the investment. The craziness in the market reflects that we are really in a biotech bubble. Axovant was created by Vivek Ramaswamy, a 29-year-old former hedge fund manager. He is also the chairman of Tekmira Pharmaceuticals (NASDAQ: TKMR). In December 2014, Ramaswamy picked up an abandoned Alzheimer’s drug called SB742457 (now known as RVT-101) from GlaxoSmithKline for €4.5 million. This is Axovant’s sole asset. RVT-101 is a selective 5-HT6 receptor antagonist and has been evaluated in 13 clinical trials. RVT-101 alone is ineffective when compared to placebo. But RVT-101 plus donepezil did demonstrate an improvement in cognition in the AZ3110866 trial (Phase IIb). Both RVT-101 and donepezil don’t treat the underlying cause of Alzheimer’s disease. The benefit of RVT-101 in combination with donepezil was only 12 weeks compared to donepezil alone. There was good reason why GlaxoSmithKline gave up the compound. Axovant isn’t alone in this field. Lundbeck and Otsuka Pharmaceutical are testing a similar drug known as idalopirdine (Lu AE58054) in Phase III trials. In March 2013, Otsuka acquired the rights to idalopirdine in the U.S., Canada, and East Asia for $675 million. 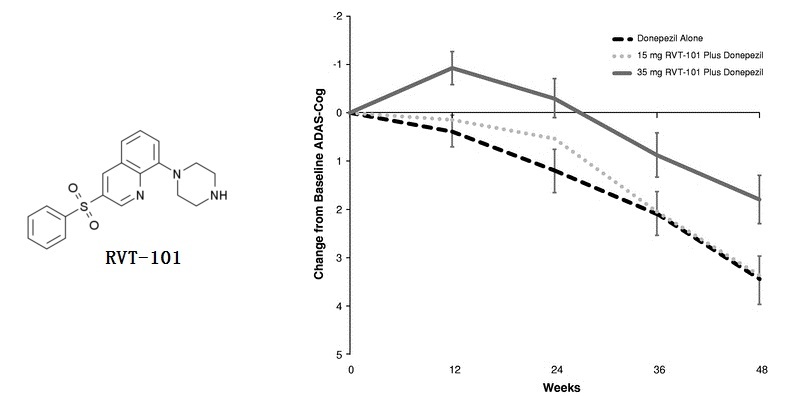 Addition of idalopirdine (90 mg/day) to donepezil treatment resulted in improved cognitive performance as measured by ADAS-Cog at Week 24. Idalopirdine seemed to be more effective than RVT-101 (mean difference in ADAS-Cog: -2.16 vs. -1.66). After the acquisition last December, Axovant didn’t conduct any clinical trial at all. But Ramaswamy got two trump cards: (1) Lawrence Friedhoff, the developer of donepezil; (2) Lawrence Olanoff, the developer of memantine. Axovant intends to begin a Phase III pivotal trial in 2015Q4 and to submit an NDA to the FDA by the end of 2017. Two other hedge funds, RA Capital Management and Visium Asset Management indicated an interest in purchasing up to $150 million of Axovant shares at the IPO price. However, they are allowed to sell their shares (if they buy) after 90 days, half the standard lock-up time. Unum Therapeutics has completed a $65 million Series B financing. New investor New Leaf Venture Partners led the round. The company was launched by Fidelity Biosciences, Atlas Venture and Sanofi-Genzyme BioVentures with a $12 million Series A financing in October 2014. Unum is developing the antibody-coupled T-cell receptor (ACTR) technology developed by Dr. Dario Campana. At St. Jude Children’s Research Hospital, Campana previously created the anti-CD19 CAR-T that Dr. Carl June at the University of Pennsylvania took into clinical trials. ACTR is a chimeric protein that combines the Fc receptor (CD16) with the signal transduction domains (4-1BB/CD3ζ). 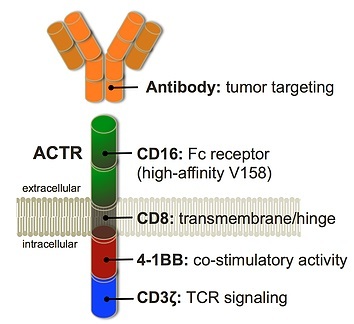 Engineered T cells bearing the ACTR can bind to a monoclonal antibody which then acts as a bridge to the tumor cells. In contrast to other CAR-T therapies that hit a single target, Unum’s approach is not restricted by antigens. In other words, one ACTR therapy can be used in combination with a variety of antibodies like Rituxan or Herceptin to attack many different cancers. In addition, the activity of CAR-T therapy can be turned up or down by adjusting antibody dose. Furthermore, Unum uses mRNA instead of a virus to modify T cells. The modified cells are disarmed in about a week. These features may avoid safety problems that were commonly reported in CAR-T trials. Unum is testing its lead ACTR therapy, ATTCK20, in combination with Rituxan in a Phase I trial. The new money gives the company enough fuel to complete a series of proof-of-concept studies. Zytiga (abiraterone) is a blockbuster drug for the treatment of metastatic castration-resistant prostate cancer. The total sales for 2014 reached $2.24 billion. Innocrin Pharmaceuticals and Tokai Pharmaceuticals (NASDAQ: TKAI) are developing me-better versions of abiraterone (VT-464 and galeterone). 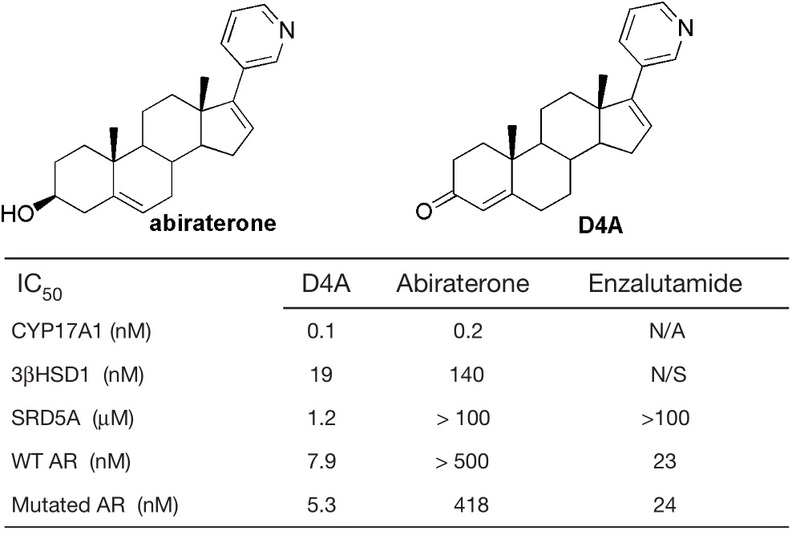 Cleveland Clinic researchers found that D4A, a major metabolite of abiraterone, is more effective than the parent drug. D4A inhibits not only CYP17A1, but also 3βHSD and SRD5A, which are required for DHT synthesis. Furthermore, D4A is a competitive, potent androgen receptor antagonist (IC50=7.9 nM). The researchers examined the effects of D4A in two prostate cancer xenograft models. D4A is more potent than abiraterone for blocking VCaP and C4-2 xenograft progression. Direct treatment with D4A is likely to result in a greater clinical benefit than abiraterone. Researchers identified a new biomarker called mismatch repair (MMR) deficiency, which predicts superior response to anti-PD1 therapy. The ORR was 62% in MMR-deficient patients compared with 0% in MMR-proficient patients. Tumors with MMR deficiency harbor many more mutations than tumors without such repair defects. Tumors with more mutations are more likely to be recognized as foreign by the immune system. Nivolumab showed promising activity in advanced liver cancer in a Phase I/II trial. The ORR in 42 evaluable patients was 19%, including two with complete responses. 68% of patients had previously received sorafenib. The overall survival rate at 12 months was 62% with nivolumab. Sorafenib is currently the only FDA-approved systemic treatment for advanced liver cancer. The response rate with sorafenib in this setting is only 2%. About one year ago, Puma Biotechnology (NASDAQ: PBYI) skyrocketed 295% after reporting the top-line results from the Phase III trial (ExteNET) of neratinib in HER2+ early breast cancer. At the ASCO2015, the company provides a primary analysis at 2 years of ExteNET trial. IDFS in the neratinib arm was 93.9% compared to 91.6% for placebo. The absolute difference of only 2.3% was lower than the market expected. Moreover, the drug caused high rates of Grade ≥ 3 diarrhea (40%). Oncothyreon’s (NASDAQ: ONTY) ONT-380, in combination with capecitabine/trastuzumab, showed promising results in HER2+ metastatic breast cancer patients previously treated with trastuzumab and T-DM1. The ORR in 27 evaluable patients was 52%. In another Phase Ib trial, 22 breast cancer patients with CNS metastases were treated with ONT-380 plus T-DM1 or ONT-380 plus capecitabine/trastuzumab. One patient had a complete response; four had a partial response and nine has a stable disease. ONT-380 selectively inhibits HER2 without significant inhibition of EGFR, avoiding EGFR-like side effects. No Grade ≥ 3 diarrhea has been seen. In April 2015, Clovis Oncology (NASDAQ: CLVS) received Breakthrough Therapy designation for PARP inhibitor rucaparib for the treatment of BRCA-mutated ovarian cancer. At the ASCO2015, the company posted positive data from a Phase II trial. The ORR in 32 patients was 82%. The median PFS was 9.4 months. Rucaparib appears superior to AstraZeneca’s olaparib. The accelerated approval of olaparib is based on an ORR of 34% and a median DOR of 7.9 months. ImmunoGen’s (NASDAQ: IMGN) IMGN853 demonstrated encouraging clinical activity in heavily pretreated patients with FRα positive platinum-resistant ovarian cancer. The ORR was 53% (n=9/17) which included one complete response and eight partial responses. IMGN853 is antibody-drug conjugate that comprises an anti-FRα antibody conjugated with DM4.